Join us at http://blog.Atamaii.com From the Senario private showroom at the 2011 New York Toy Fair, this is a preview of the Zibits Micro R/C Remote Control Robots. Zibits robot toys come from the planet Z-7. The Power Lab is the core of the planet. In there spring there are 12 different Zibits to collect, and this fall there will be another 12 Zibits released. Zibits playsets include the Power Lab, Z Crane, Z Rail, and the Zorr Mine Shaft. All of the playsets can interconnect with each other. This fall there will be action defense starter packs, with a Missile Turret, Launch the Atomicopter, and Fire the Orb Cannon! Use your Zibits to defend against the Blurge blog monsters. 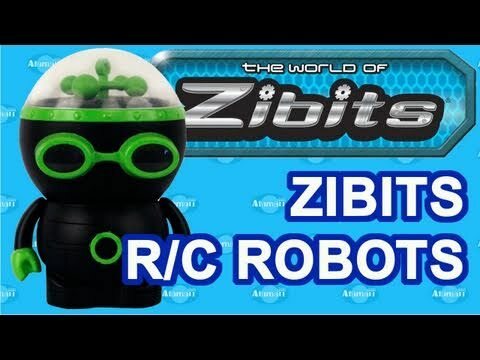 This is a Zibits Micro R/C Robot toy preview from the New York Toy Fair. @Atamaiidotcom Ithink ZX-34 doesnt like you… OFF WITH ZX-34 HEAD– IF HE HAS ONE!! @gumbanjanjan hmm the toy hit me in my watzit! Where Did the ZX-34 Hit You? I saw these at target last month on clearance.